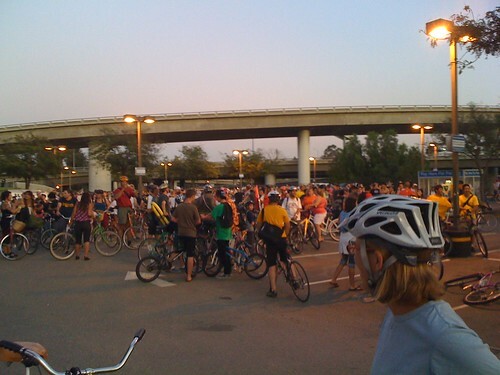 banane » Blog Archive » San Jose Bike Party!! The yell among 3500 people … “bike party!”… total group power, but we frowned on racing through reds, and managed to keep an open lane for cars. 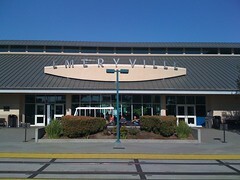 My trip started out like a normal Friday in Emeryville. I’d planned earlier that week to try Amtrak down to meet my sister in San Jose. It ended up in a long 4K attended ride through downtown San Jose. Sipping a beer, Twittering, and looking out the train’s window perhaps was in stark contrast to my usual Friday evenings: squeezed in BART with my bike, waiting to emerge from the tunnel for last minute logistics plans via cell phone, while battling with cars on the SF streets, or if I drive, sitting in traffic outside the toll booth, exhausted, desperately sneaking SMS messages about where to meet up with friends. East Bay to SF is usually a reverse commute but on Fridays the nightlife rush hour begins from 7-10PM and no route is fast or uncluttered. So this Friday I packed a light overnight bag, hauled my bike onto the bike racks of Amtrak, and got the 5:20 train, for $15. I forgot you could get beer and wine, and there’s electrical hookups too. A quick survey of the three cars before me showed that gaming was the favorite pasttime on laptops. It was incredibly relaxing. My neighbor slept almost her entire route to Fremont. 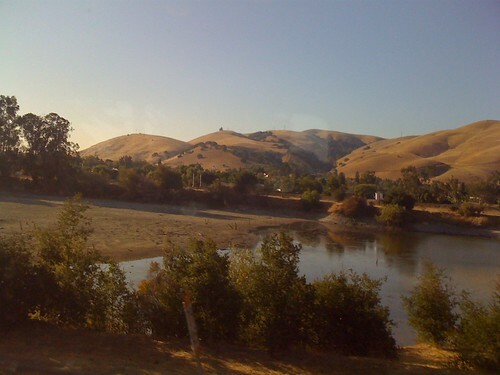 I felt somewhat guilty that I’d taken trains through Europe, Scandinavia, and Asia but not in the East Bay. My sister Sally called and I told her the announcer just said we’d arrive in 10 minutes to Diridon the downtown San Jose station. They took off from their house for the short 5 minute ride down to the station. 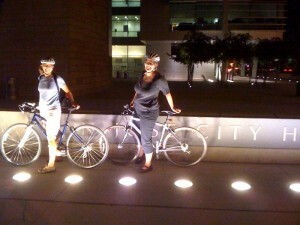 They’d meet me, we’d get something to eat, then join the San Jose Bike Party. I’d looked it up online but just to see the route, which wasn’t published until 24 hrs before. Note, I’ve only watched, never participated, in Critical Mass so didn’t really have a comparison. Yes, Amtrak arrived early (it’s like they knew I’d write about it) and I sat in the shade outside the old 1920s style station house with other college kids, backpackers, a homeless guy getting petitions to “lower car insurance,” and ten minutes or so my sister and her husband arrived. We biked about three blocks to The Poor City Bistro, blasting live blues music and serving up a quick couchon au lait- pork in milk marinade, and some Pilsner? Fat Tire? something like that. They unwound a little- Mark, my brother-in-law had been entertaining guests from Taiwan all week, and my sister had been battling with first-week-of-school issues with her two kids. I was already pretty mellow, and excited about this bike rally. I’d gotten a few messages from friends who were going to be in it, but didn’t want to coordinate the logistics of meeting up, but it gave it that feeling of eagerness and expectation, like this might be one of those random fun parties. The weather was stifling hot, not humid, but the kind that makes you seek out shade and drink a lot of water. We idly noticed that Sally had the only tiny plastic water bottle. I don’t carry water since I’m hauling my bike on rail all the time, and Mark’s old beat-up Schwinn Cruiser didn’t have a bike holder. Sally was testing a prototype bike- a ladies’ cruiser. Mark works at a bike manufacturer so he’s always testing some kind of bike. I have a Sirrus mid-range model, with some carbon parts but mostly a kind of aluminum. It’s a great city bike, but I’ve been eying the new touring bikes out. We finish and biked over to the start, the parking lot of the Tech Museum. Sally led us and Mark and I followed. She’s kind of hesitant at city biking, and while she does a lot, she usually has two kids in tow. I’m more comfortable with it as I commute through downtown SF, and Mark was pretty comfortable too. As we bike a guy creeps up on Sally with a cruiser, front tire a few feet in front, low to the ground, stretched out and custom made. A few others – BMXes and other outfitted mountain bikes, surround us and I can totally tell Sally’s urban comfort increased. We joked later about how diverse the crowd was, and how many different kind of bikes there were. It was great bike-watching. The parking lot was crammed. A guy slapped a reflective band around my wrist, and we had to get off our bikes and slowly push off down in to the huge parking lot. Later estimates said it was 3500 folks, up to 4K at the second stop en route. We did a little tour of the lot (pushing off on our feet, still too crowded to bike) and ran into some of their friends. Everyone was turning their red flickering lights on, front headlamps, and strobes. The air was still stifling hot with very little breeze, and most of the crowd was under 30. There was tons of music blasting, and odd bike whistles. We stood there for maybe 45 minutes, and the mad crowd mobbing the exit was probably the worst bit- from carrying fixies over the shrubs to just walking your bike slowly out to the start, there wasn’t a lot of great crowd control. Maybe 30 minutes into the ride things got spaced out, but I got to practice my very slow cycling skills. Usually I’m used to 3-10 cyclists next ot me at stop lights, but cycling the entire time in a crowd was a new experience. I tend to be a little aggressive and get around cyclists I think are random or more out of control. Namely, teh “beach party girls”- wearing inflatables and bathing suits, on old pastel colored cruisers. The couch-bike was pulled over by the cops the first few blocks in, no idea why. Some of Sally’s friends had been on pre-rides with the group of volunteers who run this, and gave us some insight into how they run the Bike Party. Keeping traffic open on the routes, controlling aggressive folks, just maintaining a cool “this is how we ride” atmosphere. 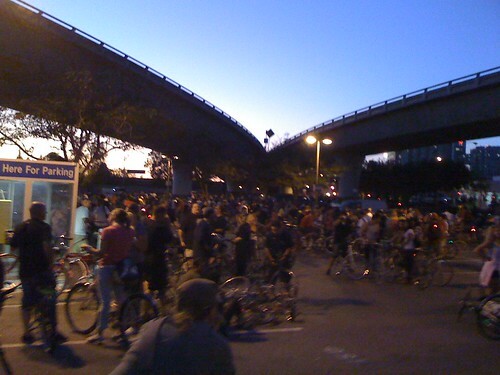 I have to say it never got as bad as Critical Mass – during the ride that I did. It was tough going so slow in such a hot night. I was dressed for work, too, but lots of people were inappropriately dressed. The cycling outfit was the rarity. Girls in muu-muus, wearing sandals or flip flops, guys in drop pants and rarely helmets. It was neat to be with so many kids, because below the drinking age, I just never really see these kids in public. Makes me think that our drinking laws have limited the amount of socialization that adolescents and young adults get. There’s not much to write of the ride itself, I didn’t know where I was half the time and we were mostly just trying to maintain yelling/visual distance from each other. We stopped in at the first break and pulled in, thinking of turning back since we didn’t have time to complete the whole 20 miles in time for the babysitter to get home (11pmish). The parking lot where we stopped was pretty intense. Later on Sally found out they counted (not sure how) 4,000 people. It was one of those random corporate microchip-built mortar and trestle style structures, with a football field sized parking lot (such poor urban design). The entire lot was full of cyclists. They were trying to steer phases or groups of people into the entrances so they could depart in phases. We were caught in the tide of departures but by that time had mapped out a shortcut. We were going to take Trimble to 1st Ave, but the expressway was too busy so Mark veered us off to an airport road, then a bike path (unlighted). My headlamp bulb had burned out so I rode between them through an almost pitch black darkness, airplanes occasionally crossing over quite low, and critters emerging once in a while from the brush. There was this strong chapperal smell- sage, hot grass, and bay laurel- along with the slightly cooler night air (though it was still really hot). Sally made some jokes about “well we’re in a group so no homeless guy will jump out and attack us,” I think it made her a little nervous. Biking in the dark along a quiet creek was really neat, in all. I was developing a neck and wrist cramp as well as my right foot falling asleep. We were super thirsty from the beer a few hours before and despite rationing we were almost out of Sally’s little water bottle. I got them to stop for a bit of a stretch when we emerged from the dark walking trail. We rode through a really cute part of downtown San Jose, North of Santa Clara (I think) that reminded me of some Parisian communities in the outlying areas under their metro. We were on her Trader Joe’s commute so she knew it like the back of her hand. They showed me the new City Hall which was just gorgeous. All of us were fascinating about cold foot baths and long drinks of water, but we managed to roll up to their house not too late and relieve the babysitter. The next morning we all found we had sore feet- from biking? Because the first hour and a half was spent pushing the bike. 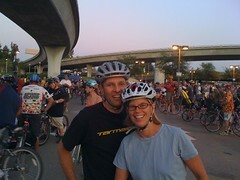 It was neat to see so many South Bay folks get together for the urban rally. It’s a fun place to bike because it’s so flat. There was a tiny hill that didn’t even phase us. San Francisco has the views, but I get tired of not having any long stretches of endless cycling, without having to navigate traffic. Written Sunday, August 23rd, 2009 in fitness, local color, south bay. You can leave a response, or trackback from your own site. Nice pics of the group. I wish we had something like that in “Tampa” Bay. Thanks for sharing. Hey Anna, I'm one of Mark and Sally's friend…Lawrence, great blog! glad to have met Sally's 8yr younger sister. I wish I knew you guys where out of water I could've shared one of my cold tasty tallboys. Hope you make it for the next ride. Hey Lawrence! Mark did mention that you were carrying, but we were 1/2 way back home by the time it really caught up with us. Good times. Wow banane, that was a nice trip! Just a great and funny bike trip. Awesome party.